Every summer I have lofty visions of the kids and I crafting the days away. Things never turn out entirely like I imagine, but we have a handful of good days mixed into the break. This year I thought it would be fun for everyone to learn how to weave. It looked like something that could be as easy or complex as you want it to be, and the kids would be able to quickly make a finished item they could hold in their hands. A month ago, we watched Annabel Wrigley's Creativebug videos, Weaving for Beginners, on YouTube. There are five in the series and they were super helpful and clear. I started shopping around for lap looms and decided I like the looks of the looms from Funem Studio on Etsy. I really liked that they included the heddle bar. I bought Mediums for the kids and a Large for myself. We just bought the looms, but there is also an option to buy kits with more supplies included. After the looms arrived, I also decided to buy a digital copy of her instructions. Other looms I looked at for the kids were the Harrisville Designs Lap Loom (Style A) and the Melissa & Doug Multi-Craft Weaving Loom. And just last week, I saw a very inexpensive loom at Target, in their wooden crafts aisle. 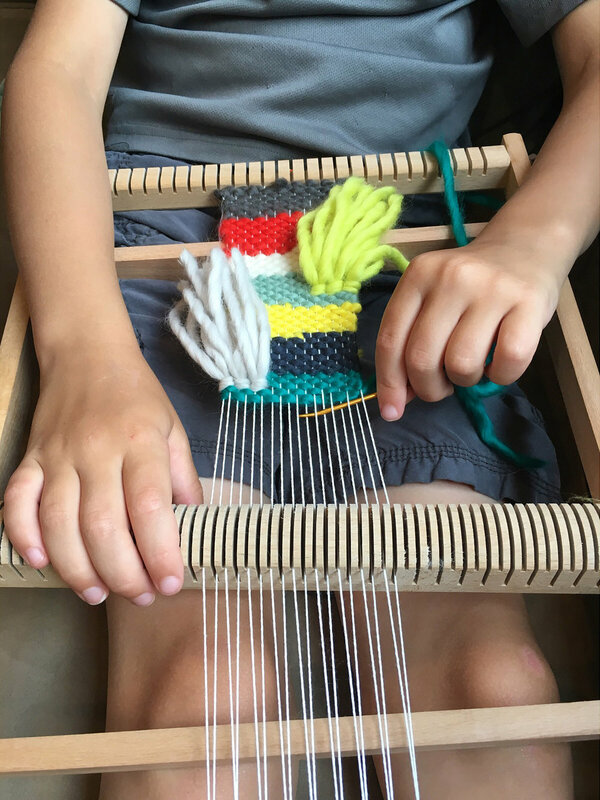 So we started weaving and my kids loved it. In fact, my 7 year old son *really* loved it. He sat still for hours working on his project! (This almost never happens). Both kids still needed help with switching colors, but besides that they did all the weaving on their own. I sort of screwed up by not having them start a few inches from the bottom, so when I pulled them off the looms to tie off the bottoms, I didn't have a lot of warp thread to work with. Lesson learned for next time though! We hung their finished art from branches we collected from the woods behind our house. And we have the looms all set up for their next (slightly bigger!) projects. I'm calling this new craft a success!